Some stupid wage slaves are under the impression that they have certain rights, nothing can be further from the truth. You have no rights, you only have duties and responsibilities. The duty of a wage slave is to work hard for his master, to die at war for his master, to bleed in the trenches for his master. The duty of a wage slave is to put all thoughts of authentic freedom aside, in order to wholeheartedly serve my corporations. The duty of a wage slave is to fall into debt so that this debt may be used to further entrap his weak psychology. You might think you’re free, you might think you have rights, but as my buddy Bloomberg put it so eloquently, ‘no right is guaranteed’. Kim Jong-un of Workers' Party of Korea is the third and youngest son of deceased North Korean leader Kim Jong-il and his consort Ko Young-hee. He is Daejang (General) of the Korean People's Army. 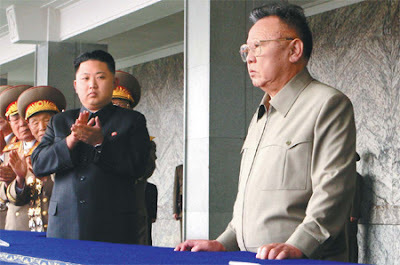 Kim Jong-un became the leader of the country after his father's death on December 17, 2011. On January 15, 2009 the South Korean news agency, Yonhap, reported that Kim Jong-il appointed Kim Jong-un to be his successor. He succeeded his father Kim Jong-il as the head of the Korean Workers' Party and de-facto leader of North Korea.